The three pillars of law – advocacy, judiciary and prosecution – have to work closely together to secure a society’s rightful system. Swisslex as the leading legal database in Switzerland wanted to underline just that and, as is their company tradition, show it in a technical advanced way. The idea of the SLX Arena was born. A game in Virtual Reality (VR) where three people, each one with different abilities, work together to solve of a puzzle. At first glance the technology of VR seems to contradict such a concept as the market currently focuses on single-player experiences. Thanks to networking technology used in games and the compatibility of the HTC Vive to track multiple persons in the same (real) room we were able to connect three devices to let the players be present in VR in realtime. The mixed-reality aspect of the SLX Arena is an important element of the game. On one hand, on a visual level, the players are immersed in the virtual world of the 3d arena surrounding. 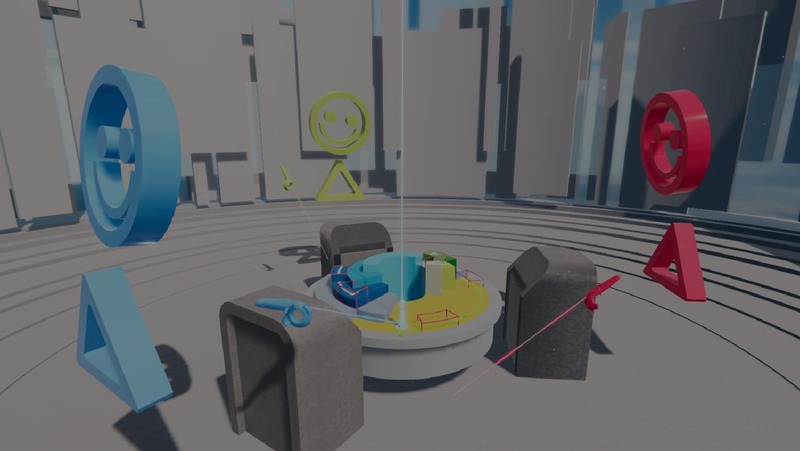 On the other hand, the players are connected in the real world on an auditory level and talk to eachother, discuss strategies and enabling cooperation to solve the puzzle – possible thanks to the mentioned realtime presence in VR. That players can hear each other also helps to spot the real location of the other players and gives orientation in the virtual part of the game. The SLX Arena on an architectural level cites monuments like libraries, auditoriums as well as university lecture rooms to transport the idea of know-how transfer and knowledge base Swisslex is built upon. The SLX Arena was presented at the 9th annual Swiss Lawyer Congress in the KKL Lucerne for two days where it has received overwhelmingly positive feedbacks with players praising the feeling of teamwork they got while playing the game and the joy of solving the puzzle together. Upon request the game is available to play in the Gbanga VR Lab in Zurich. Check the portfolio entry for more details.